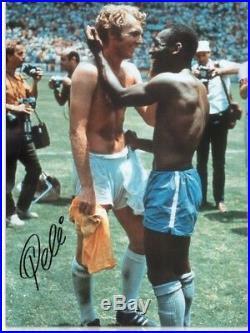 WE HAVE WORKED CLOSELY WITH THE GREAT PELE FOR A MANY YEARS NOW. THIS IS FROM A SIGNING IN BIRMINGHAM IN JUNE 2017. WE HAVE HAD TWO EXCLUSIVE CONTRACTS, ONE FOR WORLDWIDE SIGNATURE RIGHTS, ONE FOR UK RIGHTS MORE RECENTLY. WE HAVE HAD HIM HERE FOR SHOWS THREE TIMES AND WE ARE GOING TO BRING HIM NEXT YEAR FOR MORE SHOWD. 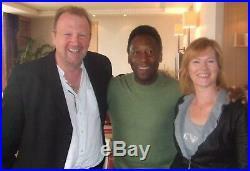 IF YOU ARE AFTER A SIGNED PELE ITEM THAT IS GUARANTEED GENUINE AND VERY GOOD VALUE. About A1 Sporting Speakers. Books from Gazza Jimmy Greaves Wayne Rooney and many more will be available as well as new releases from Luis Suarez and the forthcoming Steven Gerrard book. We will also be offering signed non sports memorabilia such as our signed music memorabilia and film memorabilia. Tickets for the shows we will be doing will also be available here with chances to meet Sir Geoff Hurst , Gordon Banks and other members of 66 properly at exclusive smaller events we will be conducting in the coming months and years. There will be special restaurant vouchers to dine in some very special places and we are hoping to be promoting a few theatre shows later with some new and exciting names. We like to think our reputation precedes us and over the years we have had many thousands of happy customers. Any questions or customer service please call Terry on 07973 387294 or Freda on 07866 454714. With the marketplace now flooded with fakes it is very difficult to distinguish between genuine items that have to potential to increase in value and worthless counterfeits. A1 Sporting Speakers puts its name to every item because all of our signed items are 100% genuinely hand-signed. We conduct official signing sessions, where every star is paid for each individual signature. There can be no marketplace without these celebrities so we consider it fair to pay them for their signatures. We worked extensively with the late greats. Sir Henry Coper and Alan Ball. Certificate of Authenticity – Each item comes with a COA issued by A1 Sporting Speakers Verifiable company history – A1 Sporting Speakers is a registered UK Ltd company and have been trading for over 15 years. Exclusive contracts – We have had many exclusive contracts with sport legends such as Sir Geoff Hurst, Pele, Jimmy Greaves & the members of the England 1966 World Cup Winning team. Our events company A1 Sporting Speakers enables you have direct access to see the legends of sport live and allows us close contact with sporting greats. High quality of products – We have the highest possible standards for our products. Product range – An ever changing and stunning range of over 100 unique products and growing! 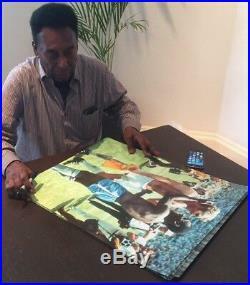 The item “PELE SIGNED PELE/MOORE 16×12 PHOTOSUPERB VALUE £99.99 With COA Try A Close Offer” is in sale since Monday, July 31, 2017. This item is in the category “Sports Memorabilia\Football Memorabilia\Autographs (Original)\Signed Photos\Retired Players”. The seller is “a1-sporting-speakers” and is located in Christchurch, Dorset. This item can be shipped to United Kingdom. Daisy Ridley Signed Star Wars VII: The Force Awakens 10×16 Close Up Movie Pos.. Daisy Ridley became an overnight sensation when she became one of the new faces of the infamous â?? Playing the brave and headstrong role of Rey Daisy Ridley completely transforms into the character and becomes someone we all root for when watching â?? Star Wars: The Force Awakensâ? The young actress is only getting started and with more Star Wars movies to come her star is only going to get bigger! Re a true Star Wars fan you absolutely have to have this hand-signed picture of Daisy Ridley as Rey and show all of your friends and family that the force is with you! 100% Guaranteed AuthenticIncludes Steiner Sports & PSA/DNA Certificate of AuthenticityFeatures Tamper-Evident Steiner Hologram & PSA/DNA labelThis Product Is Not Eligible For Discounts Or Promotions. At Steiner Sports We Pride Ourselves on Service, Integrity, and Quality. Steiner Sports is the leading producer of authentic hand-signed collectibles and the best source for all your sports gift needs. Autographed memorabilia by athletes like Hank Aaron, Joe Namath, Magic Johnson and Muhammad Ali is the hottest new solution for personal and client gifts, as well as sales incentives, employee recognition and charity fundraising auctions. Steiner Sports has exclusive autograph deals with Derek Jeter, Mariano Rivera, Ray Rice, Eli Manning, Mark Teixeira, Henrik Lundqvist and Lou Holtz among others. Service We represent the needs of our customers first, and personal attention is a cornerstone. If you have a special request or need a collectible to be personalized, Steiner can make it happen for you. Integrity Our line of hand-signed memorabilia is guaranteed authentic. Each piece has a hologram with a matching certificate of authenticity so you can be confident in your investment. As our motto states, The Steiner Seal Means It’s Real. ” Quality We research thousands of photographs to find the ones that capture the greatest moments in sports, like Ali defeating Liston, Carlton Fisk’s dramatic World Series home run, or Franco Harris’ “Immaculate Reception. We sell only authentic equipment, top-of-the-line glass cases, and our photos are wood-framed and double-matted. Large and bulky items including chairs and other items may have additional charges. No credit will be issued if any of the above is missing. Pack carefully and return to: Steiner Sports Memorabilia 145 Huguenot Street New Rochelle, NY 10801. All merchandise is considered to belong to you until we receive it back in satisfactory condition. This listing is currently undergoing maintenance, we apologise for any inconvenience caused. 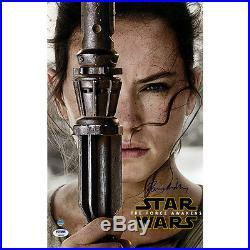 The item “Daisy Ridley Signed Star Wars VII The Force Awakens 10×16 Close Up Movie Pos” is in sale since Friday, May 26, 2017. This item is in the category “Sports Mem, Cards & Fan Shop\Autographs-Original\Football-NFL\Other Autographed NFL Items”. The seller is “steinersports” and is located in United States. This item can be shipped to North, South, or Latin America, all countries in Europe, all countries in continental Asia, Australia.